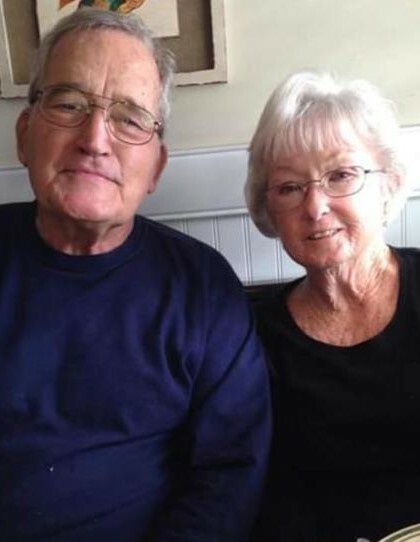 Chester “Chet” Wayne Reel, 83, Russiaville, formerly of Clearwater, Florida, passed away at 8:11 p.m. on Wednesday, March 20, 2019, at Community Howard Regional Health, in Kokomo. He was born November 16, 1935, in Kokomo, to Kenneth and Vera (Shively) Reel. Carolyn Sue (Perkins) Reel, 84, Russiaville, formerly of Clearwater, Florida, passed away at 5:30 a.m. on Sunday, April 14, 2019, at her home. She was born January 8, 1935, in Sweetser, to James and Margret (Stevens) Perkins. Chet and Carolyn were married on April 20, 1956. Chet was a 1953 graduate of Kokomo High School. He retired as a store manager from Circle K Convenience Stores in Florida. Chet loved all kinds of sports, especially horseshoes and basketball. He loved to play cards, all types of games, and enjoyed horseracing and coordinating the family NASCAR league competition. He was a former member of the Indiana State Class A Horseshoe Pitchers Association, the Kokomo Horseshoe Club, and the Clearwater Horseshoe Club. He was a very competitive thrower and finished as high as runner-up in the State Tournament and was ranked in the top 20 nationally. Carolyn was a 1954 graduate of Kokomo High School. She was a licensed hairdresser for many years and had her own shop in her home in West Middleton for 10 years. Carolyn’s joys in life were reading, sewing and cooking. She took great pride in maintaining her home and creating a good environment in which her children could grow. Chet and Carolyn attended Skycrest United Methodist Church in Clearwater, Florida. They are survived by their daughters, Lynn (Roger) Waddell, Lori (Bo) Britton and Susan (Rick) Burns; son, Patrick (Megan) Reel; grandchildren, Stephanie (Ray) Collins, Adam (Lindsay) Waddell, Mandi Britton (David Carson – fiancé), Emily (Norian) Mundy, Jeremy (Abby Lynn) Williams, Ryan (Katie) Williams, Meghan Oster and Harlee Mae Reel; 17 great-grandchildren, plus one due in June; 3 great-great-grandchildren; Chet’s brother, Bill (Ida) Reel; and sister-in-law, Sondra Reel; Carolyn’s sister, Janice (Ned) Maughmer; brother, Tom (Barb) Perkins; and sister-in-law, Barbra Perkins; and many nieces and nephews. Chet was preceded in death by his parents and brother, Bob Reel. Carolyn was preceded in death by her parents; brother, Jimmy Perkins; and dear aunts who raised her, Helen “Aunt Bee” Sheridan and Lorena Lowder. A celebration of life open house will be held from 6 to 9 p.m. on Saturday, April 20, 2019, at the Jeff Stout Community Center, 650 N. West St., Russiaville. Memorial contributions may be made to Western Buddy Bag/RUMC, P.O. Box 63, Russiaville, IN, 46979. Stout & Son Funeral Home, Russiaville, has been entrusted with arrangements. Messages of condolence may be made online at www.stoutandson.com.